march is frost seeding time! With the snow falling today (2/16/16), it's hard to imagine that frost seeding time is right around the corner. March is usually a great time to add some legumes into your pastures or hayfields. It is a way to improve pastures without losing a production year. Added legumes will boost production and fill in thin patches or bare spots; they will provide needed nitrogen to the grasses already growing, and provide protein for the livestock. Little or no tillage is involved which reduces the potential for soil erosion. Hopefully, you did your homework last fall by checking the forage quantity, types and groundcover. If not, take a walk after the snow melts! Frost seeding is the same as any other type of seeding or planting, seed-to-soil contact is critical. What works with this technique is the freeze-thaw process in late winter/early spring. As the days get above freezing and nights are below freezing, this action works the seeds down into the soil in preparation for germination. Spreading seed on frozen ground reduces the potential to rut up the pasture. This can be done early morning or late in the day. Legumes work best for frost seeding due to the shape of their seeds. 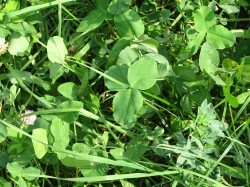 Success will vary farm to farm, but clovers will establish better, specifically red clovers. They are shorter-lived in a pasture; a way to offset that would be to frost seed red clover with slower-establishing birdsfoot trefoil. By the time the clover dies out, the trefoil will be growing well. Another way would be to routinely frost seed half of your pastures every year. It can be an inexpensive improvement. Alfalfa can be frost seeded, but don't try to seed into a field with alfalfa (even a thin stand) growing. The existing plants have an allelopathic (toxic effect) on alfalfa seedlings; they won't let them grow and become established. Suggested rates are below. The price of seed is relatively low, so don't skimp. Frost seeding grasses may have limited results, but is more successful with bunch type grasses like orchardgrass. Try seeding some on a small scale. If the pasture is tall or matted, your success with grasses or legumes may be limited. An option to try is to broadcast the seed and let livestock in - carefully - for a flash or quick grazing. Between their minor munching and hoof action, the seed will have a better chance of reaching the soil. Also, a light disking or harrowing could scratch the ground enough to let the seed get down the soil to grow. You may need to frost seed grasses and legumes separately due to the seeds different shape. Equipment for frost seeding can be as little or as big as needed. The size of the pasture or field will dictate what's needed, unless you have time to walk a large field with a small cyclone spreader. A broadcaster can be mounted on the back of an ATV or small tractor. Fertilization will help seedlings get established as well as existing grasses. Wait until late summer if a soil test shows phosphorous or potassium is needed. Sometimes overgrazing or continuously grazing will leave bare or thin spots, or kill the existing legumes. Frost seedings can be done to improve the stand, but this will only be a short term fix. Rotationally grazing is the best way to improve a stand for the long term. Frost seeding will return legumes to the pastures; dividing the pasture into at least four paddocks will provide forages time to rest and regrow through the growing season. Grazing needs to be carefully managed early season to prevent damage to the tender seedlings, yet allow light to reach them. Who can predict what this spring will be like? Dry spring conditions will discourage seed germination. Unfortunately, there is no way to control this. With the seed in place, there is a chance that it will germinate and grow when sufficient moisture is there.